President Donald Trump announced new trade policies Thursday, which are expected to go into place in the coming weeks. One of the results of these tariffs will likely be an increase in how much you're paying for a six-pack of beer or soda. The new tariffs include a 25% tariff on foreign steel and 10% on aluminum. Overall, the policies will have widespread impact, but within the beer industry, brewers expect their costs to go up and that may mean those costs are passed along to the beer-drinking public. MillerCoors, one of the US's biggest beer producers, pulled no punches on Twitter. 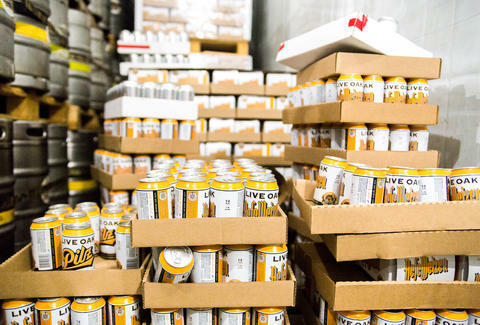 "Like most brewers, we are selling an increasing amount of our beers in aluminum cans, and this action will cause aluminum prices to rise," the company tweeted Thursday. "It is likely to lead to job losses across the beer industry. We buy as much domestic can sheet aluminum as is available, however, there simply isn't enough supply to satisfy the demands of American beverage makers like us. American workers and American consumers will suffer as a result of this misguided tariff." The Milwaukee Journal Sentinel reports that for every dollar of beer produced in the US, brewers spend about "a dime for cans and roughly five cents for aluminum." So, aluminum isn't the largest cost in the process, but it's not insignificant. Additionally, more than half of the beer sold in the US comes in cans. The beer industry has been critical of the tariffs since they were proposed last month when The Beer Institute put out a strongly worded letter imploring the administration to leave the materials used for canning out of any potential tariff. The Brewers Association, which represents American craft breweries, feels similarly. "American craft breweries are in almost every congressional district and employ more than 130,000 Americans in manufacturing and service industry jobs. The Brewers Association strongly opposes the imposition of tariffs on imported cansheet aluminum and cautions against any action that would result in increased prices for small and independent brewers and their customers," it wrote in a statement. The policy is intended to increase aluminum production in the US. However, a February 1 letter from the American Beverage Association, Heineken, Pepsico, Coca-Cola, the Can Manufacturers Institute, Molson Coors, and many others cautioned about the unintended consequences of these tariffs. "A tariff or quota will immediately disadvantage these domestic businesses," the letter read, "since foreign competitors would have the advantage of not paying an artificially inflated raw cost. We estimate a tariff of 10% on this aluminum would cost beer and beverage producers $256.3 million." Brewers could begin to bottle beers that had previously been canned. Mark Stutrud, Founder and President of Summit Brewing, told Thrillist, "We’re fortunate, too, to operate both a canning line and a bottling line — we can keep delivering great beer to people in either package." But not every brewery is in a position with the ability to bottle or can product. For many craft breweries, transitioning would mean incurring new costs and potentially increasing the cost of beer anyhow. Other products that could face similar issues due to new tariffs include canned foods and cars. But, you know, nothing gets people riled up like messing with their beer.